Yes it's 95 degrees outside! But believe it or not, Halloween is just over a month away! Our Not-At-All-Spooky Halloween Party is the event of the season and we've just opened registration. If you've never celebrated Halloween at Purple Monkey, you're in for a (trick or) treat! 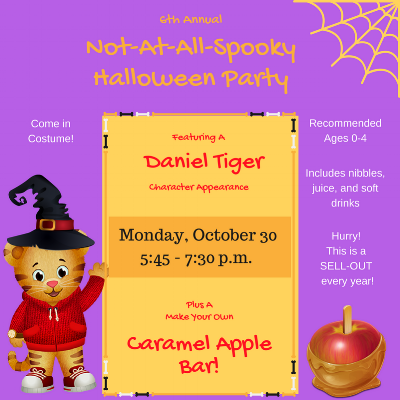 Our always-sold-out event this year features Daniel Tiger, a Halloween-themed craft, and a make-your-own caramel apple bar!